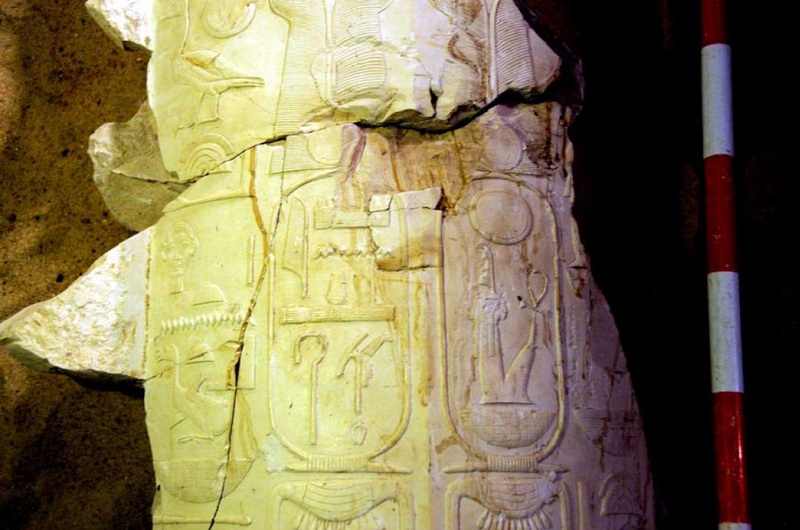 There has long been a debate among historians and Egyptologists over whether Amenhotep III and his son, the future Akhenaten shared a co-regency towards the end of the father’s reign, with some experts positing a power sharing arrangement lasting as long as 12 years or as short as two years. Much of the recent scholarship on the controversy has argued against the co-regency theory altogether. There has been no solid archaeological evidence to resolve the debate, but on Thursday Dr. Mohammed Ibrahim, Egypt’s Minister of Antiquities, announced that inscriptions found in the Luxor tomb of Vizier Amenhotep-Huy provide conclusive evidence that Amenhotep III shared power with Akhenaten for at least eight years in the waning days of the elder’s reign. The inscriptions were carved onto architectural remains, collapsed walls and columns, in tomb number 28 in the El Asasif area of Luxor. Some of the inscriptions depict scenes of father and son together in the same space as one follows the other. There are also cartouches — the prenomen or throne name of a pharaoh surrounded by a protective oval — of both pharaohs next to each other. Traditionally, viziers’ tombs always bear the cartouche of the pharaoh they served under. As if that weren’t bonanza enough, the inscriptions date to a very specific time: the first Heb-Sed of Amenhotep III. The Heb-Sed was a feast like a royal jubilee celebrated by a pharaoh 30 years into his reign and then every three years after that. Since Amenhotep ruled for approximately 38 years (1388–1351 B.C. or 1391–1353 B.C.). Records survive referring to his 38th regnal year and some historians believe he may have begun his 39th but died very soon into it. That means father and son were co-regents for at least eight years. Amenhotep III has the most surviving statues of any pharaoh, 250 of them from the beginning of his reign all the way through to the end. The ones towards the end depict an ailing man. Forensic examination of his mummy found evidence of arthritis, obesity and a plethora of dental caries and abscesses which must have been excruciatingly painful. He was in his 50s at the time of his death, so it makes sense that after ruling over Egypt since he was a boy, he enlisted his son to help him when his myriad illnesses made the business of pharaohing increasingly difficult. The vizier’s tomb was first unearthed in 1978. 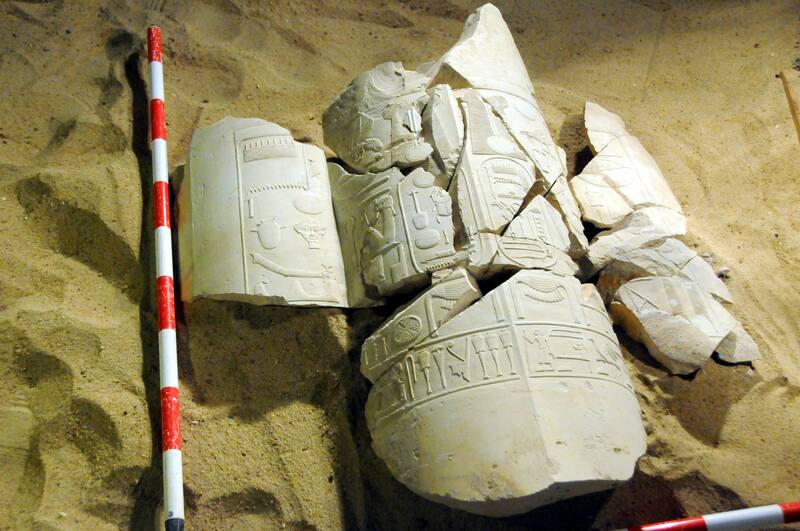 A multi-national team led by the Instituto de Estudios del Antiguo Egipto de Madrid have been excavating, recording and studying the architectural elements of the tomb since 2009. You can read more about on the website of the Vizier Amenhotep-Huy Project. It’s in Spanish, but if you can’t read it in the original it’s worth it to use an online translator to explore the excavation diaries for each season. There are some great videos of the digs too.